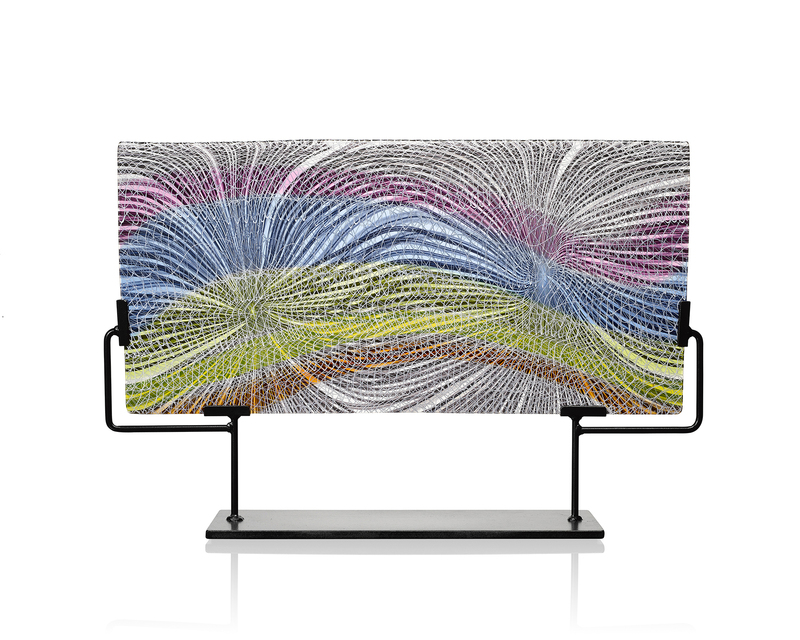 Joshua Bernbaum, Fraunhofer Lines (Horizontal Pane), 2017. H 12, W 25 in. The Chesterfield Gallery in New York City is curently featuring new work by Vermont-based glass artist Joshua Bernbaum that stretches outside of the artist's usual signature aesthetic, departing from design and moving into a much more conceptual, abstract realm. Bernbaum is deepening his focus on color and gesturing towards science as he does so. The Glass Quarterly Hot Sheet spoke with both Bernbaum and the owner of the Chesterfield Gallery, Simon Abrahms, to learn more about this new exhibition. Glass: The exhibition title "Fraunhofer Lines" refers to a scientific term to do with optics and astronomy. Can you explain a bit more about how you took your inspiration from this scientific phenomena? Bernbaum: Fraunhofer was a 19th century German physicist who discovered an optical phenomenon seen through a telescope when a particular type of glass was employed. He created a type of lead glass for a telescope through which the viewer could make out thin black lines called absorption lines, indicating the absorption of gasses in the atmosphere and resulting in the omission of certain colors in the color spectrum. Today scientists still use these lines to better understand the sun and the stars. I was fascinated by the idea that the creation of this glass could allow people to see things that they had never seen before. I am always looking for this type of inspiration. Glass: You use traditional Italian techniques in these works, such as cane technique in which bundles of thin glass rods form polychrome designs. Is there a significance in your looking back to the past in this way? Bernbaum: I'm very interested in these types of techniques but I mostly use them as just a means to support my more contemporary approach. I enjoy the old techniques but they occasionally bore me so I really try to use them in new ways. Glass: I understand you are particularly interested in color. Can you talk a bit more about your approach? Bernbaum: I'm very interested in color relationships and how colors react with one another. I like to play with contrast and juxtaposition. I also like to create the colors I use from scratch, a practice that isn't so common anymore. 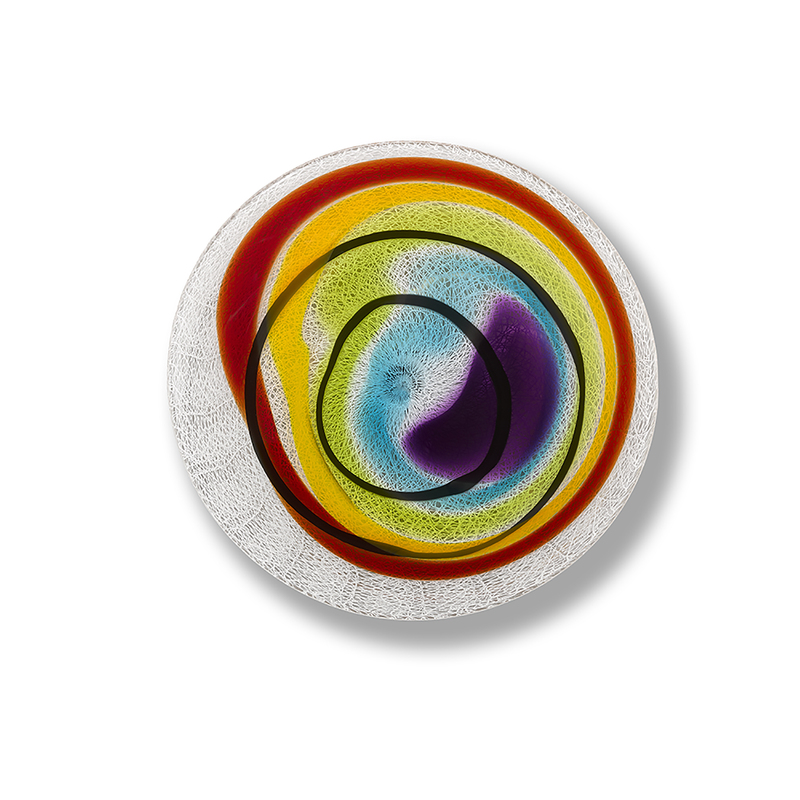 This requires the use of two furnaces, one for clear glass and one for melting colors. Many people stick with pre-prepared colors, that while cheaper and less time consuming, leave less room for experimenting. Making my own colors allows me to expand the potential of what can be done with color. Joshua Bernbaum, Fraunhofer Lines (Rondel 1), 2017. H 18 1/4, W 18 1/4, D 3 in. Glass: Simon, does this new work on view by Joshua represent a breakthrough within your usual repertoire of what you usually display at Chesterfield Gallery? Simon Abrahms: We've been working with Josh for a few years now and in that time he's been exploring flat glass, which I think a lot of people who don't consider themselves glass enthusiasts really connect with. When collectors are used to paintings, drawings, and photographs they're predisposed to looking at that as the way to live with their art so getting people excited about glass is one thing that's exciting about this work for us. He's one of the first artists we've worked with who is making work that is true to himself but also has the ability to reach that new audience. 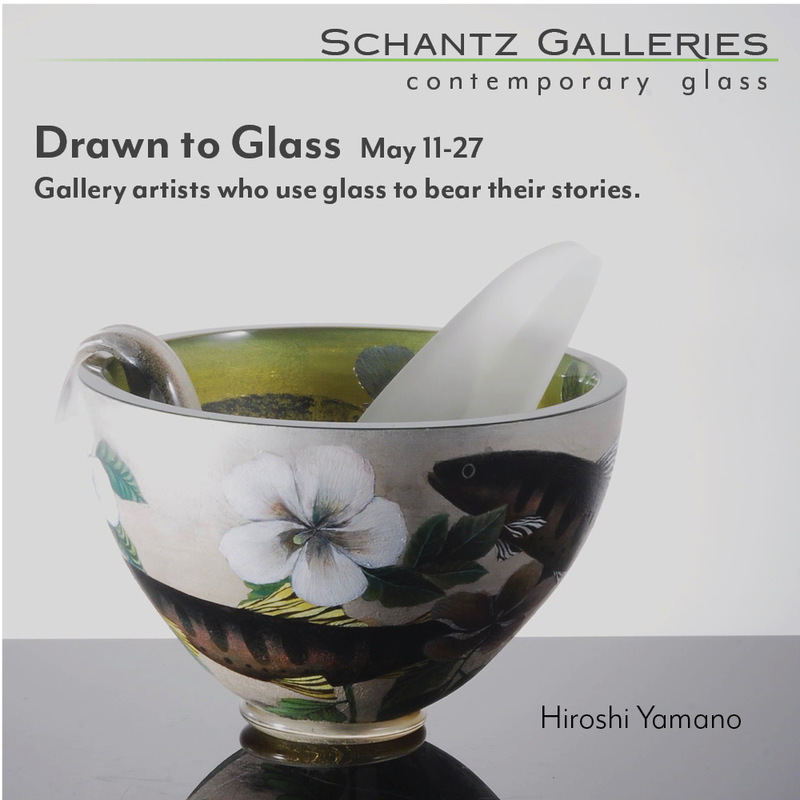 Glass: Your gallery tends to cover objects that lie between art and design. How does this work bridge the gap between the two, if it does, and what interests you about this duality that often defines glass art? Abrahms: I think, again, it's very much about livability, especially for the collectors who live in cities where they have limited space. People want to curate their spaces and if they see how their lighting and furniture successfully coexist with sculpture, that's very appealing to a lot of people. Once people have seen these things in the right context together, they tend to better appreciate each piece and see how they're greater than just the sum of their parts. 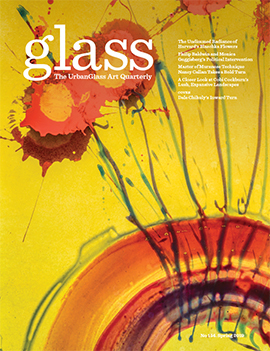 Glass: In general, how does this work influence the direction in which the gallery is going? Abrahms: I think more than anything, this work ties into the direction of the gallery in that it remains true to our mission of showing work that is exceptional technically, but is also scalable, which is something that interests me a great deal. I would like to see more large-scale glass installations incorporated in the design of not just individual collectors' homes, but corporate collections, restaurants, hotels, hospitals, airports, and other public spaces where more people can see just how incredible these artists' work is and I think Josh is one of the artists capable of making that kind of impact.